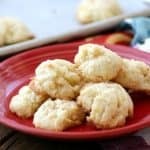 Cream Cheese Cookies – light and so delicious, these cookies are super simple to make and don’t require much work. They’re extra tasty sprinkled with colored sugar for special occasions or for cookie trays. 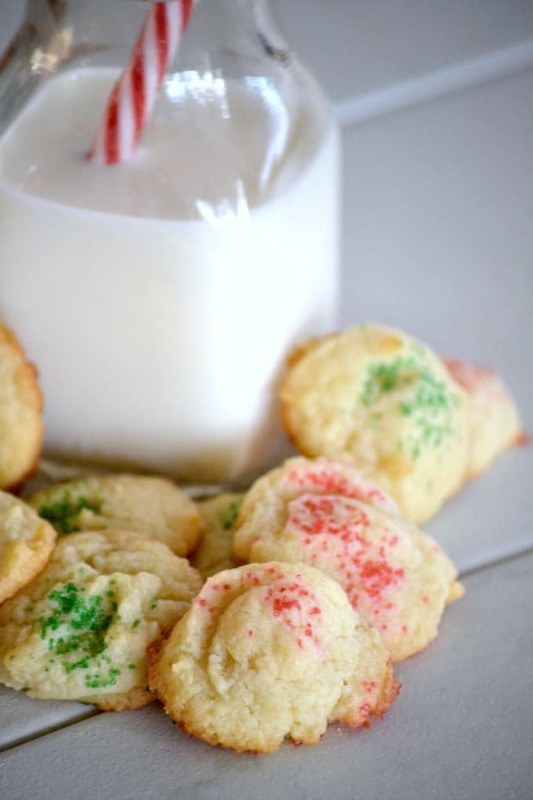 These Cream Cheese Cookies are most definitely one of my all-time favorites. I’ve included some affiliate links in this post as I think they’ll help you with this recipe and I thank you for your support. Grandma made these a lot when I was growing up. And I do me A LOT! They’re just so easy to put together and they’re gone in a flash every single time I make them. You just seriously can’t. stop. eating. them. They’re a perfect cookie any time of year, too. 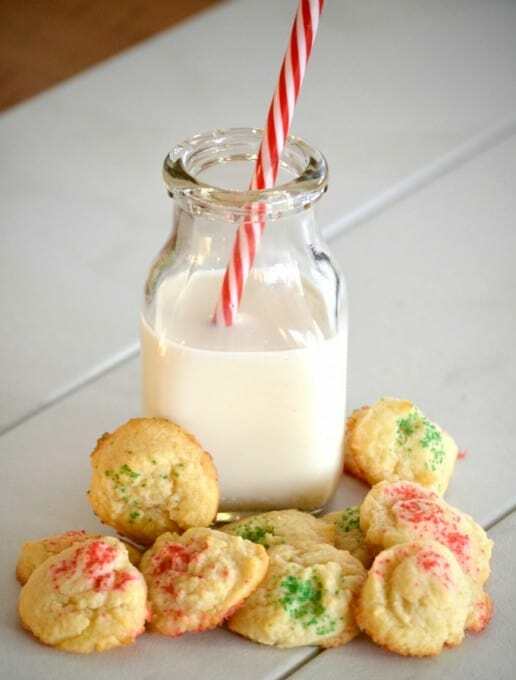 When Grandma made them during the holidays she’d sprinkle red and green sugar on top to make them more festive. It really just made me eat more of them because I loved how they looked. You don’t want to leave them in the oven too long because the bottoms and edges can darken quickly. I like mine just a bit golden around the edges. If they’re a little darker they’re fine, too, but more than that they’ll taste burnt. And ain’t nobody like a burnt cookie! Use these items to make your own Cream Cheese Cookies – this mixer, and these baking trays. Please note that the amount of cookies this recipe usually makes is about 48 and it will make that many if you use a level TEASPOON. They will be small cookies and they won’t spread. We love them this size and it’s the way Grandma made them, so I’m sticking with it. I’ve only made them a little bit bigger a time or two, maybe two teaspoonfuls, but watch the baking time. They may need to bake a minute or two longer depending on the size. 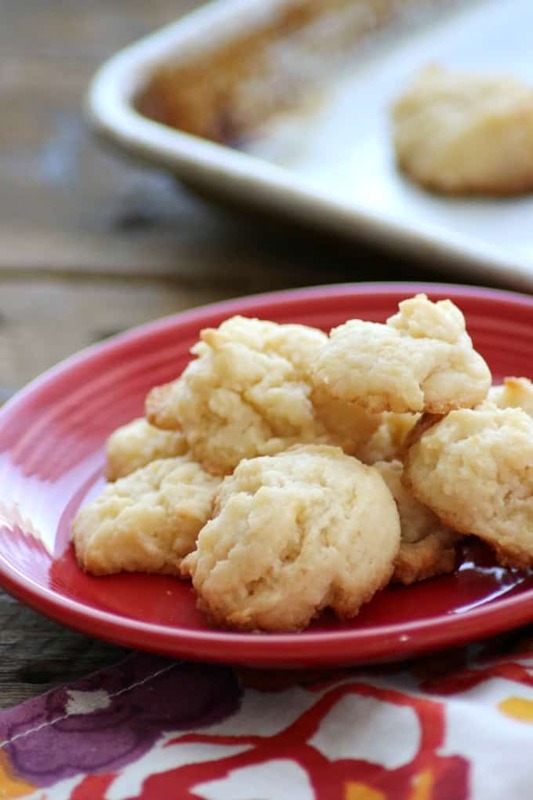 Take a look at these short Cream Cheese Cookies Video! 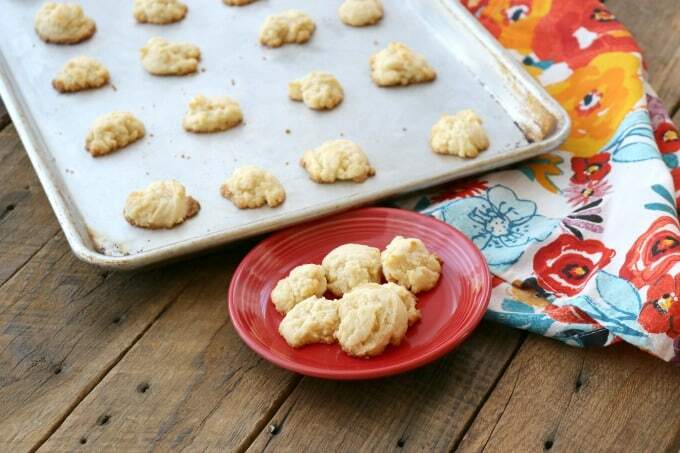 These cream cheese cookies are so light and delicious, They're super simple to make, and it's easy to eat more than one! 1/2 cup shortening you can also substitute butter in the same amount, but I've always used shortening. In a mixer, cream together cream cheese and shortening. Add sugar, egg yolk, flour, salt, and vanilla and thoroughly combine. Drop by level teaspoons onto cookie sheet. Sprinkle with colored sugars to decorate before placing into the oven. Bake for 13-15 minutes or until edges are lightly golden. In order to get the amount of cookies described in this recipe, you MUST use a level TEASPOON. They're small, but we really like the size. 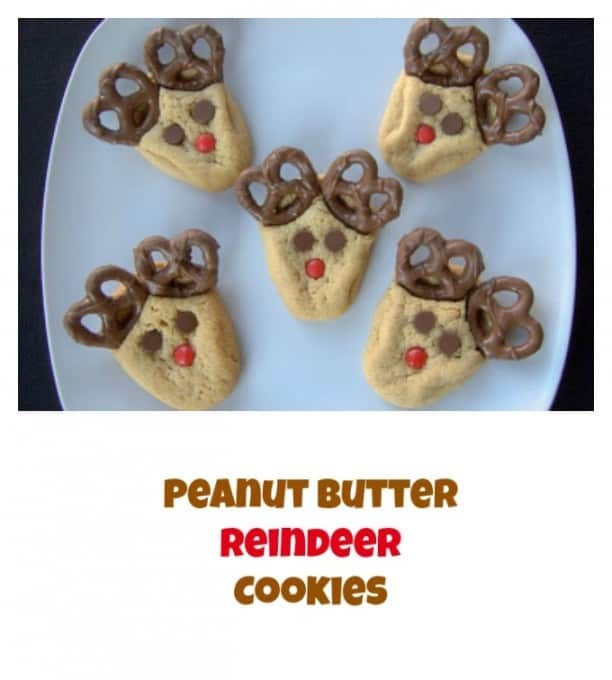 Be sure to check out these videos for some great Christmas cookies, too! This post has been updated with pictures. Originally posted December 3, 2015. Fran, you can definitely use butter in place of the shortening. My grandmother never did and I never have, but she has it written in the recipe that it can be used. Kyonte, the dough for these cookies is a bit more sticky. Make sure that you sift the flour and then measure it into the cup. If you measure the flour then sift and do no remeasure it into the cup, you’ll have too much, so that could be your issue. they are tasty but mine came out flat. your pictures look better. why? I’m sorry, Dale! Could you have used butter instead of shortening? When I’ve done that the cookies are definitely flatter. The ones in the picture have been made with shortening. Does it matter , butter flavored or reg shortening? Shelley, I don’t think it matters, either would be fine. Enjoy! Faye, I have never worked with a cookie gun, so I wouldn’t be able to tell you, unfortunately. I’m sorry. I’d love to know how they came out with the cookie gun! I just made them as directed and they’re yummy! Thanks so much, Erin! I’m so glad you enjoyed them. Thanks so much, Carol for letting us know! Do I first measure the flour and then sift? O do I sift and then measure a cup of flour. Thanks! They look sssssoh good! whenever a recipe calls for “1 cup sifted flour” – you always want to measure the flour then sift THEN measure the correct amount you need again because you will have some flour left over. This is because the sifting aerates it, removing any lumps and leaving it lighter. It will also incorporate with the wet ingredients better. Lynne, I guess I’m dense, but I’m still confused about order of sifting. ? Linda, think of the comma as dividing the sifting and measuring instructions. 1 cup sifted flour – measure sifted flour. Thanks clarifying for me. ? Melissa, the sifter helps to aerate the dry ingredients so that the moist ingredients will stick to them better. Also, in this recipe because the recipe calls for sifted flour and not flour, sifted (notice the comma) – you want to measure 1 cup of flour, sift, and then measure a cup of the sifted flour again. You’ll end up with a little more flour after you’ve sifted it. If you have a whisk, use that to mix the flour a few times after you’ve measured the cup and then remeasure again. You’ll incorporate a little more air into the flour and it should help you. More often than not, I use a fine sieve to sift as it’s just easier than pulling out my sifter. Hope this helps! One cup sifted flour means sift then measure. One cup flour sifted means measure then sift. I would not recommend putting this recipe in a cookies gun. As a person that makes Swedish Spritz every year, the dough is too moist and gluey to do well as a pressed cookie. Yes, I use a cookie gun and shape them like stars and flowers, etc………. They sound yummy! Do they need to be refrigerated because of the cream cheese? Okay for mailing? Estimated duration of safe period considering Cream Cheese? Do you think these would be good with a thin frosting? Or too sweet? they might be, but I do think they would be too sweet. I really do like them just as they are, but it’s probably because I grew up with them that way and wouldn’t change a thing. If you do add the frosting, I’d love to hear what you think! I made these today. Delicious! My first batch got over-browned bottoms like yours. I was using a new cookie sheet, now I know what I need to do. I used half butter, half shortening (was using up partials I had) and the cookies turned out great. Thinking of trying some lemon or other flavor extract for variety in future batches. Thanks for the recipe! Denise, I’m so glad you like them!! Even if the bottoms are a little brown, they still taste delicious – I just wouldn’t want them to become too too dark. Lynne, wouldn’t butter tend to brown bottoms of cookies quicker, opposed to shortening? Thanks. Use a silpat mat to prevent over browning. Bottoms turn out like store bought cookies. I’m surprise there is no baking powder/soda called for! Is that right? I always use all-purpose flour unless specified otherwise. This is probably a stupid question but do you sift the flour before measuring it out or after? Hi Fran, and definitely not a stupid question as it’s always something that I would be confused about, too. In this case, you’re going to sift the flour before you measure it into the recipe. So, what I do is to measure a cup of flour, sift it, then spoon it back into the measuring cup and level it off with a knife. There will be an little bit of flour left over. If a recipe calls for a cup of flour, sifted… then you want to measure the flour into the cup and then sift, but use the entire amount in the recipe. It’s important that you know at what point to sift because it does change the amount of flour and you could be using more or less which could alter your outcome. When sifting, you always end up with lighter flour, hence the change in the amount. These cookies sound delicious, so I will be trying them sometime this week. I will be using a convection oven, so you automatically decrease the oven temp by 25 degrees. I also will have to watch, as cookies bake faster in a convection oven. I always line my pans with parchment paper so my cookies never get over-browned or burned bottoms. For the lady who asked about baking powder/soda, don’t forget eggs are also a leavening agent. Lucy, thanks so much for the reminder about the eggs and the tip on the convection oven. I’ve never used one, but am definitely intrigued as to how they are. I hope you enjoyed them! Has anyone tried making these with almond flour or coconut flour to lower the carbs? Not to my knowledge, Barbara, but if you do, please let me know and I can put a note into the post. These flours are more dense and therefore more liquid needed….. possibly the whole egg! Do you grease or spray the cookie sheet? Nana, you do not have to grease the cookie sheets, but if it’s a concern you can or use parchment. One of my patients’ mother used to make a similar spritz cookie every year; I’m hoping these will taste like them. I’ve never used the batter in a cookie press, Davette, but some followers have they taste great! I hope these were what you were looking for! Kosher salt has a different texture than regular table salt, usually a slightly larger crystal which gives you more of a flavor burst which is great when topping cookies, other sweets or savory items. When dissolved into food, you can’t tell the difference between the two, and on the plus side, Kosher salt does contain less additives such as iodine. Also, kosher salt has a larger crystal size than, day table or pickling salt, even without the addition of iodine that pickling salt does not. So if you’re not going to use kosher salt, and use pickling salt instead (recommended so as not to add iodine which can alter either/both flavor and/or color of foods), use half to 2/3 less to accommodate the volume taken up by the crystals. So if the recipe calls for 1/2 tsp of kosher salt, try using only 1/4 tsp of pickling salt, which not only doesn’t contain iodine but neither non-caking agents as well. Just plain sodium chloride crystals. Ker cookbook and you use yellow cake mix and a few other things..
Those sound great as well, Bev! I’m not sure where my grandmother found her recipe – wish I did. Do these taste like gooey butter cake?? Thats what i am looking for. Patti, believe it or not, I have never had gooey butter cake – have to change that, soon! So, unfortunately I can’t compare these cookies to it, but my guess would be that they don’t. Sorry about that, Joan. I’ve made them countless times and have come up with the same results. Could you have used something larger than a teaspoon to make the cookies? A tablespoon, perhaps? Thank you for mentioning this! I was wondering if it was in fact a teaspoon! They seem so small when you put them on the pan! ? I used my scoop, which is probably about a tablespoon, and I got about 28 cookies, too. A teaspoon just seemed SO small. And I assume you meant an actual measuring teaspoon, not a table teaspoon, right? Do these freeze at all? Vicky, I have never frozen them since my family devours them pretty quickly after they’re made. I do believe my grandmother froze them though, but can’t say for sure. Has anyone tried making these with Splenda instead of sugar? I am trying to limit sugar. Hey Lynne !! These look absolutely delicious. I definitely plan on making these 🙂 I have a question, where did you get your milk jug type glasses. I love them, perfect for serving doughnuts and milk for the grandchildren ? Yes, you can definitely double it, Ruthie! Just made these. Followed the recipe exactly. I don’t know why but they tasted awful. My friend and husband tried them andthey really disliked them. They had a weird aftertaste and the texture of a biscuit. Read other reviews that loved them so what went wrong.? Lacy, I am so sorry to hear that. I appreciate your feedback and am happy that you let me know. As to why they didn’t turn out, unfortunately I don’t have a definitive answer, but I’m thinking it may have been that there was too much flour. When measuring “sifted flour” called for in this recipe, I measure one cup of flour, sift it into a bowl and then measure the sifted flour into the measuring cup again. Inevitably, there is always a bit of flour left over. Could that have been the problem? Other than that, expired ingredients perhaps? I’m also wondering if you used whipped cream cheese as opposed to the block of cream cheese. That may account for a different result as well, Lacy. I’d love to hear if you try them again and get a different result! Can you use Sea Salt? When I was growing up my mom made the cookie dough, put it in the freezer and then we’d roll it out to use cookie cutters. Can this dough be used for those types of cookies? Wendy, I’ve only ever made the cookies by dropping them onto the baking sheet. I don’t see why it wouldn’t work if you put it in the freezer. Try not to use too much flour on your work surface as it could make the dough tough. I’d suggest using some lightly floured parchment. If you try it, please let me know how it turns out! Made these tonight and they are fantastic. Aw, thank you so much, Barbie. That’s so wonderful to hear. Thanks for letting me know. 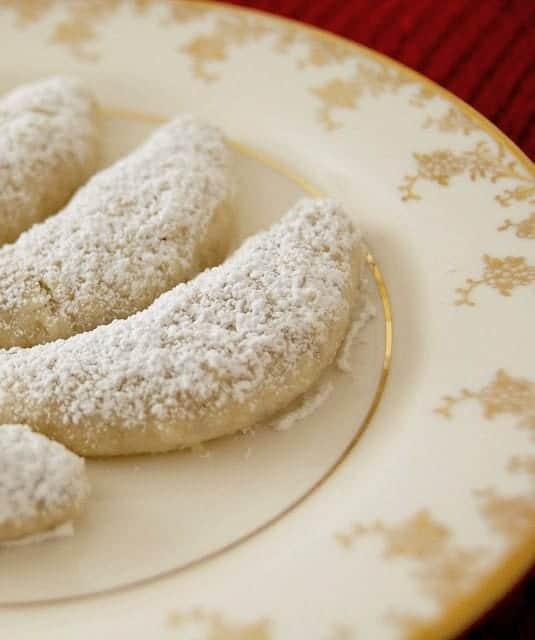 Hi….I have an old family recipe of these cookies bit it calls for 2 cups of flour and calls for a cookie press. 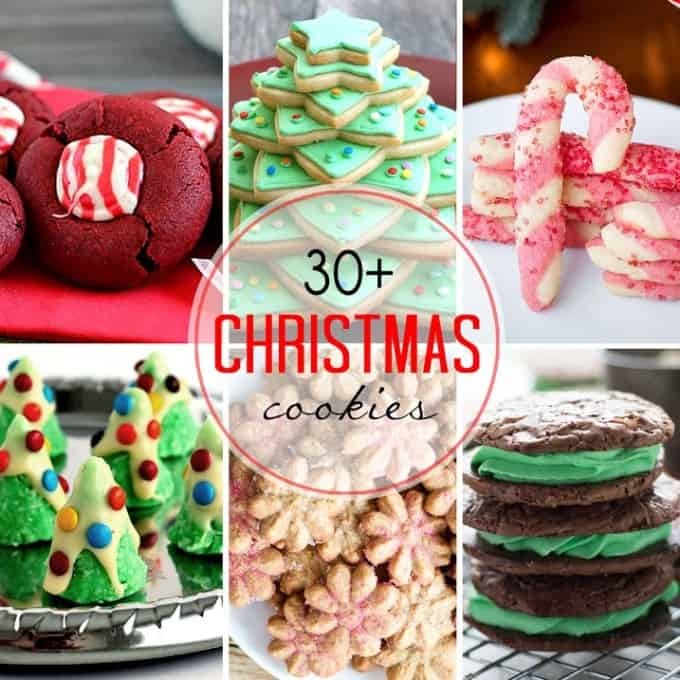 I want to make these cookies like yours where you put on cookie sheet by teaspoons….1 cup of flour or 2….which should I use?? Linda, I would follow your own family recipe as is or make my cookies per my recipe without changing the amount of flour because altering the amount can greatly affect the outcome and they won’t taste as good. I made these cookies and I followed the recipe to the t. And when I allowed my cookies to cool and split one open it was very much greasy and undercooked. The flavor was good but greasy. Just made these cookies. I dropped them by level teaspoon as you said. They didn’t spread out as they baked. They look exactly as they did when I dropped them. They don’t look like yours. They are however very tasty. They just look funny. Any suggestions as to what went wrong? Recipe says drop by level teaspoons. A level teaspoon is really small and then to bake for 13-15 minutes seems too long. Did you really mean “level teaspoon” which is going to make a really small cookie? Hi Lynne! This may be a dumb question sorry, but recipe calls for egg yolk, does that mean not the whole egg, no egg white? I am going to be making these shortly, they sound so good! Thanks so much, Deborah. Hope you enjoy them! Great idea, JoAnn. I’ll have to do that next time as well! What kind of flour did you use? Self rising? Or All purpose? 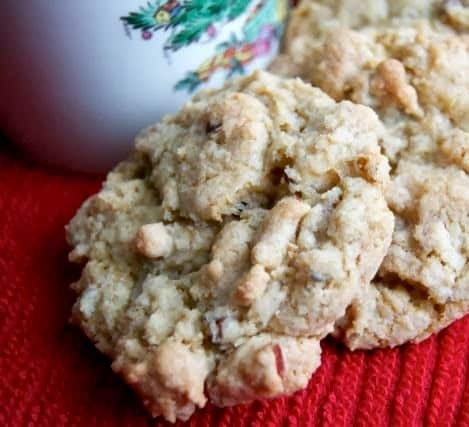 Linda, I always use all-purpose flour in my recipes unless I specify otherwise, so it was all-purpose flour in these cream cheese cookies as well. Is the dough supposed to be sticky? Thanks. Yes, Stephanie, the dough will be sticky. Good tip, Kim. I know shortening can go rancid, but I never thought to mention that to her as well. Thanks! I’ve made these twice 🙂 First time, I followed recipe exactly, but used my scoop that is probably at least a tablespoon. It only made 28 cookies, but I liked them. The second time, I doubled the recipe, used butter, and a cookie press. They only needed to bake 11 minutes, but they made a cute light little cookie. I think it was a mistake to double the recipe, or maybe I should have refrigerated it between pressing & baking. The last batch or so really spread. I’m not sure if that was the reason, or if it was the butter, or what. Yummy nonetheless! Can this recipe be put through a cookie press? I made these. Thank you for the recipe. To me they tasted a lot like butter cookies. They are very soft. The cream cheese is very subtle. I made a batch with lemon. I looked forward to them. They were not as amazing as I thought they would be. The after taste is conflicting to my taste buds. Basic recipe is best. I got 24 cookies. I used a heaping teaspoon. My family does not like small cookies. My true test is what cookies taste like the second day…we shall see. Thank you again for posting. Merry Christmas happy cookie baking all. Hi Lynne, I love straight forward method baking. Gonna try this. Was wondering if the cream cheese and butter (no shortening) need to be at room temperature before working on it? Can a ballon whisker do the job instead of a mixer? Thank you so much for sharing. Thank you, Rachel! If just using a whisk to mix, it will be much less work for you if those ingredients are at room temperature. Enjoy the cookies! Tried these for the first time 2 months ago and we loved them. We all thought the same thing, that they have a barely noticeable hint of a citrus taste. So I have been making them (4 more times ) using half vanilla and half Fiori Di Sicilia, and they taste amazing and not too citrusy! Thank you for the new simple and delicious addition to our cookie rotation! Salted or unsalted butter – Thank you! The cookies are tasty and easy to make, but this recipe doesn’t make anywhere close to 48 cookies. I’m not sure it would make 48 even if you doubled it. I made these last night and they were amazing. My son devoured them. Quick question…do you think I could half the sugar and put white chocolate chips in them? If I added it without cutting down on the sugar, it’d be too sweet, so I’m thinking if I cut down on the sugar I could add the chips. Thoughts? I gotta try these cream cheese cookies!! Thanks so much, Jocelyn! They’re pretty delicious!